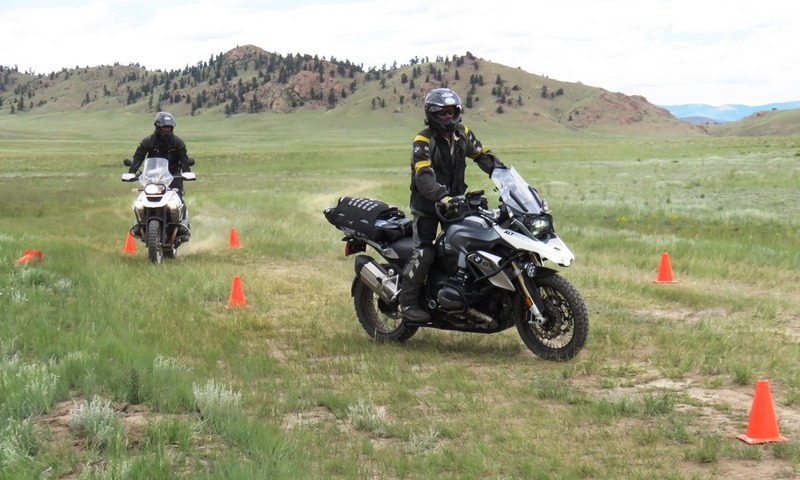 In January this year I bought a 2015 BMW R1200GS Adventure and, in order to feel more confident riding the beast on unpaved roads, I decided to sign up for the two-day, Level-1 Intro to Adventure rider training course at RawHyde-Offroad.com taking place in mid-July near Hartsel, Colorado. The itinerary for our Intro course is listed on that webpage. Additionally I signed up for their “Pre-Training” session and the subsequent two-day “High Rockies Adventure.” The pre-training session on Friday afternoon allowed the instructors to give us more personalized attention in a smaller group and we could reinforce the techniques during the additional practice in the full-day sessions. 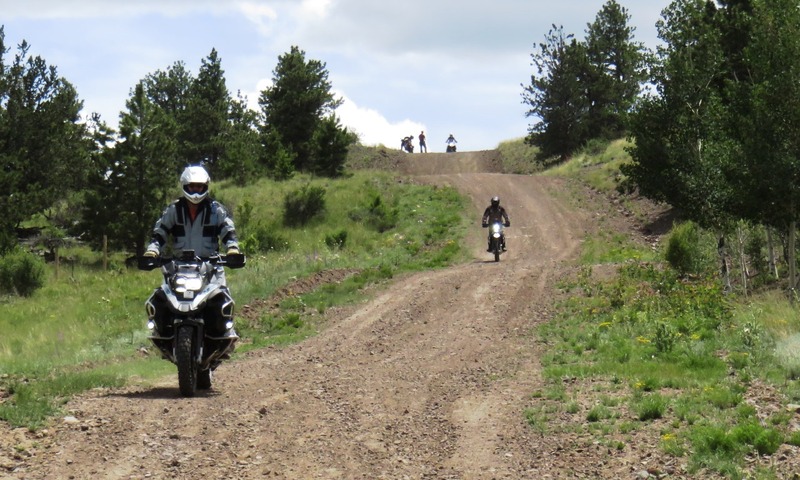 Prior to attending the course, I had purchased the BMW GS Off-Road Riding Skills Instructional DVD and found it quite helpful in preparing me for the training experience at RawHyde’s camp. Additionally, I found several useful videos on YouTube, including RawHyde’s own playlist. 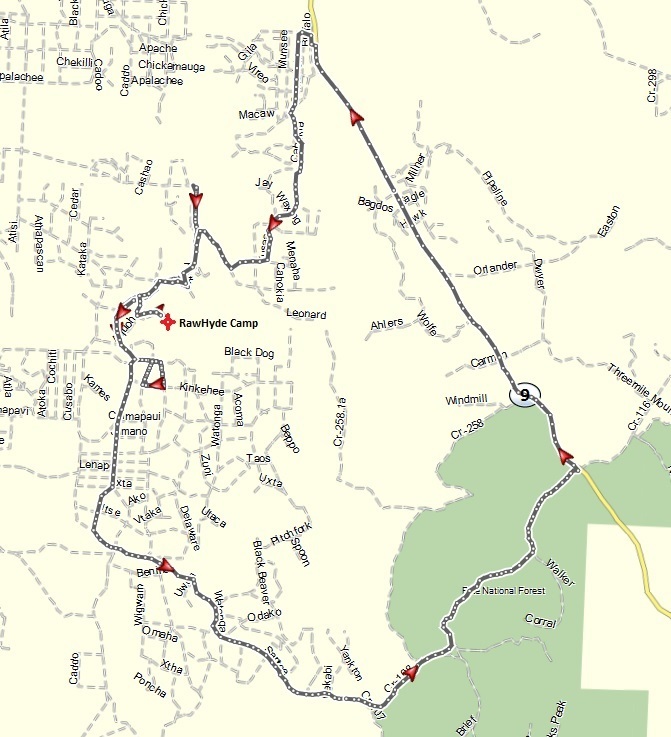 The RawHyde training camp is located at around 9,500-ft elevation near CR-53, just 13 miles south of the US-24/CO-9 intersection at Hartsel. 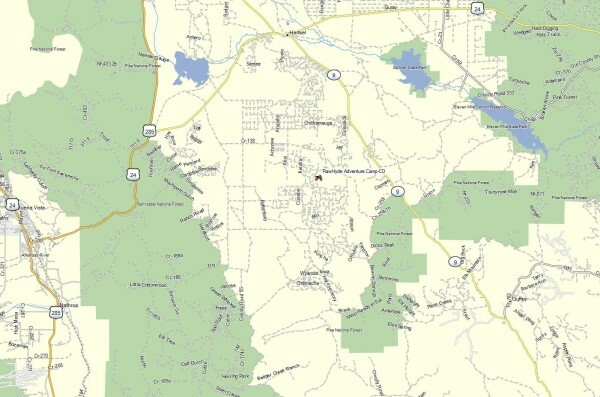 The following map provides a general overview of the camp’s location in central Colorado. 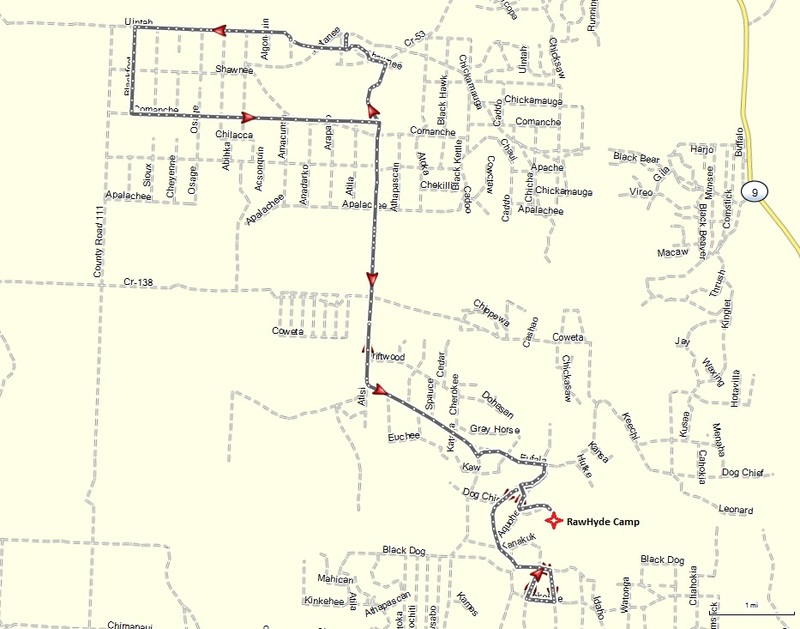 The area around the camp had once been plotted as a development project with numerous unpaved, public roads throughout the area, and scarcely any buildings. 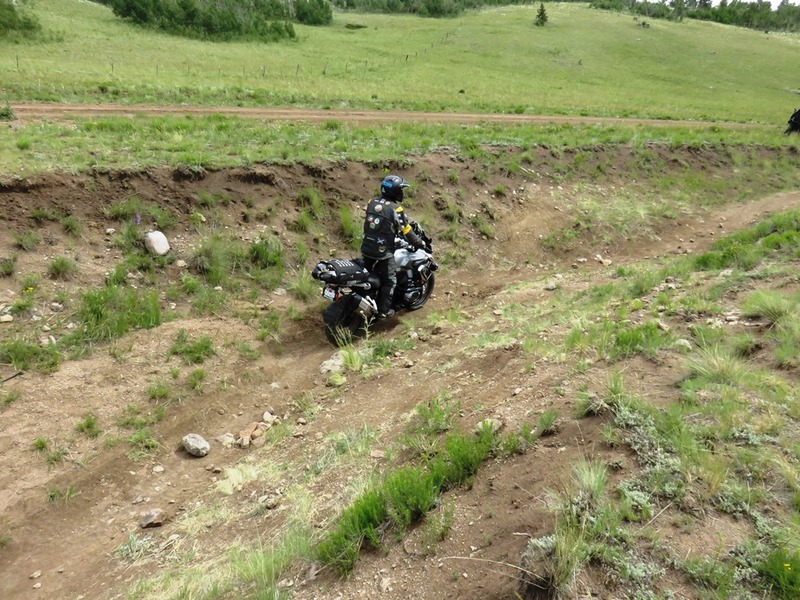 Although the project didn’t succeed, it left behind a nearly perfect off-road training ground for beginners. 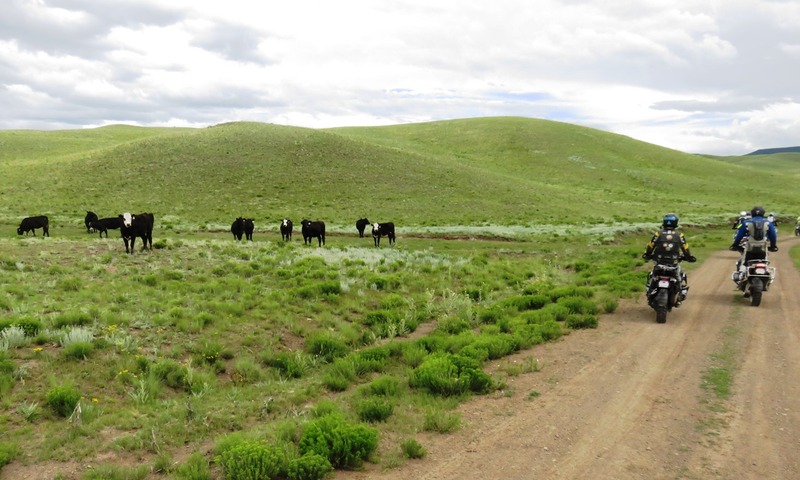 Much of the area is also open-range for livestock. From the hilltop at the camp, we enjoyed this gorgeous view of the mountain range to the west. The camp facilities were somewhat minimal, although adequate for short-term stays, consisting of a single large shed along several smaller bunkhouse buildings, campers, and tents. Staff members provided very good meals and looked after our needs. Up to four instructors were present to help us master our riding lessons. This next panoramic photo shows a view of the camp area shortly after I arrived for their Pre-Training session around 10 AM MDT on Friday, July 10th. Several more trainees arrived later that day. Since I had opted for the upgrade to a “deluxe tent,” I was assigned one of the yellow and white “Eureka” tents that are visible to the left of the building. The next photo shows a closer view of these tents. Each tent is mounted on a wooden platform and contains a mattress on a cot, a chair, a small table, and a battery-powered lamp. Each bed has quality sheets and a heavy blanket, called by some there a “Russian Army” blanket. Since the temperature inside the tent typically dropped into the low 40s at night, the heavy blanket was nice. Other participants at the camp were assigned a “tent” in a specially designed trailer parked behind the building. 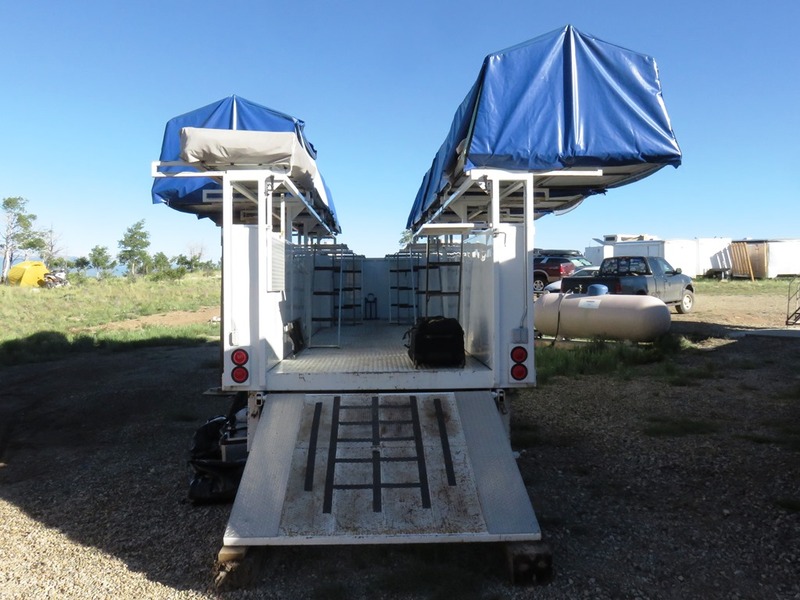 The tents are attached to elevated platforms along the sides of the trailer and accessed by short ladders. Although I didn’t take a look inside the bunkhouse, other attendees indicated that the accommodations were quite sufficient. The camp also provided for some degree of “comfort” facilities. 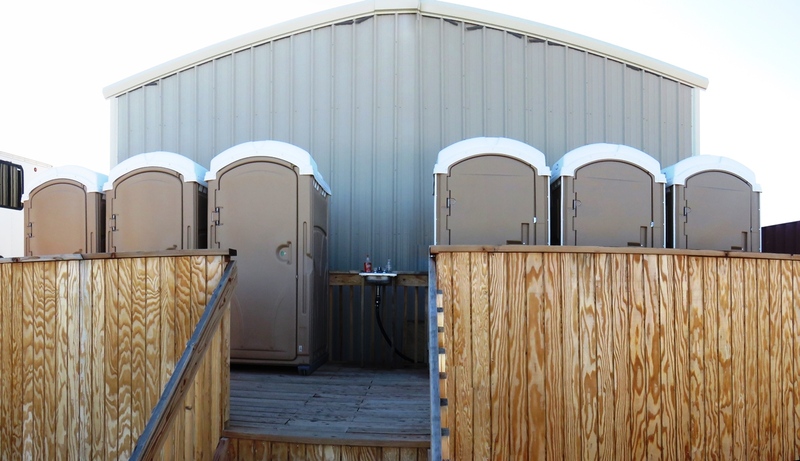 Behind the building on an elevated platform are three portable toilets (left) and three showers of similar appearance (right). The sink in the middle supplies running cold water when the diesel generator is running to provide electricity for the camp and the water pump. Upon my arrival, I signed in with Lea, one of four very friendly female employees, and was given my name tag, etc. Trev, one of the trainers, introduced himself and showed me around the camp, explaining the “ropes” and assisted me in transferring my luggage from my motorcycle to my designated Eureka tent, the one on the far left in the earlier photo. The four instructors for our “Intro” group for the weekend were Trev, Dusty, Russell, and Matt. 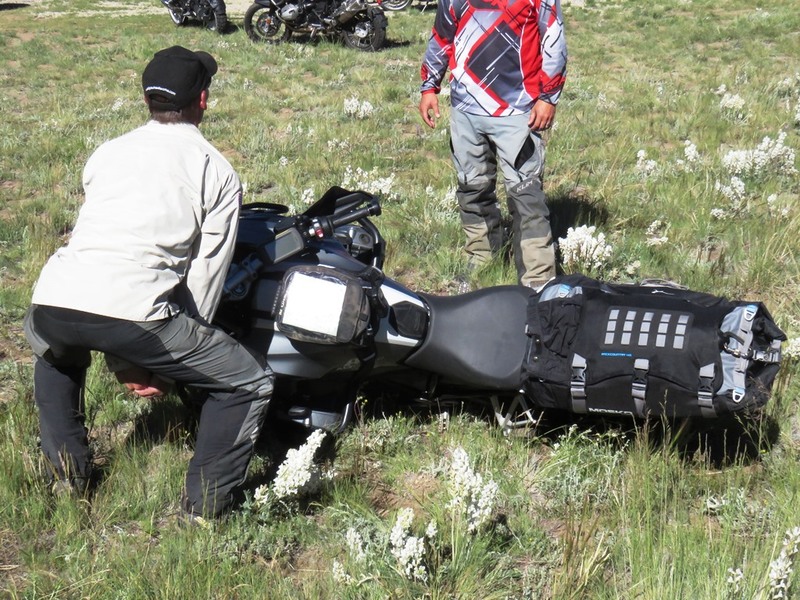 In order to minimize potential damage during a crash, we then proceeded to prepare our motorcycles for the training sessions by removing vulnerable accessories, such as both mirrors, the windscreen, along with the top case and panniers. The turn signal stalks were also zip-tied in a vertical position, facing forward. The handlebar was repositioned upward for best posture when riding while standing on the foot pegs. 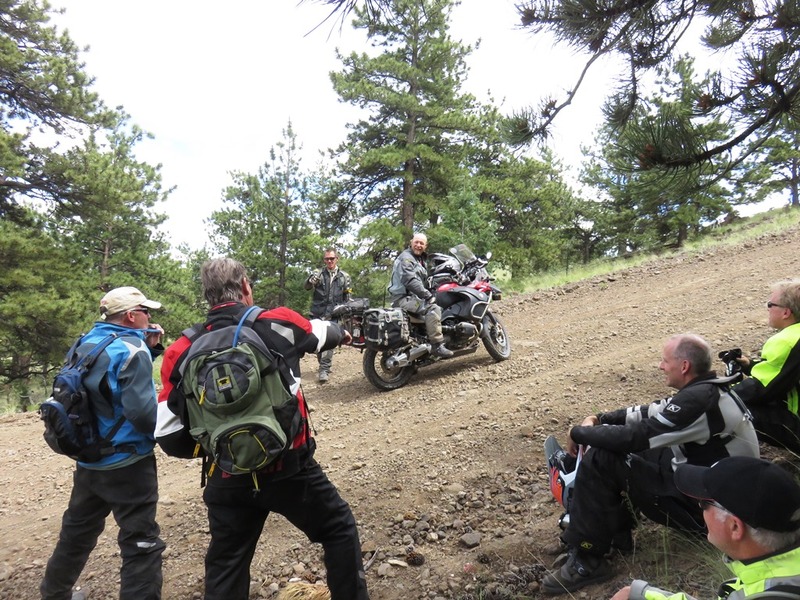 In this next photo, instructor Trev is describing aspects of off-road bike protection and preparation to several of the attendees. 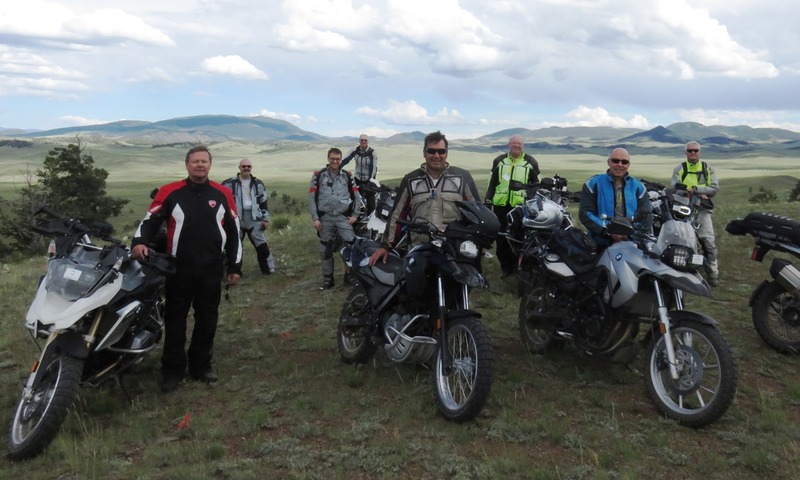 As soon as everyone attending the Preliminary Session and their motorcycles were ready to begin our initial training, we donned our riding gear and at 2 PM headed out to the training area, located a short distance south of the camp. For this exercise, our instructors were Trev and Russell. The following map shows the track log from my GPS. From the camp we headed back out the entrance “driveway” and turned left. Our trainers had us perform several exercises around the loop. This next photo shows Trev and Russell on the far left explaining our first series of exercises to perform: standing on only one foot peg and then the other. The goal is to keep our bikes properly balanced while shifting our weight side-to-side. In a later exercise, we alternately swung our legs fully across the seat. In the subsequent photos, Russell demonstrates the first exercise for us. 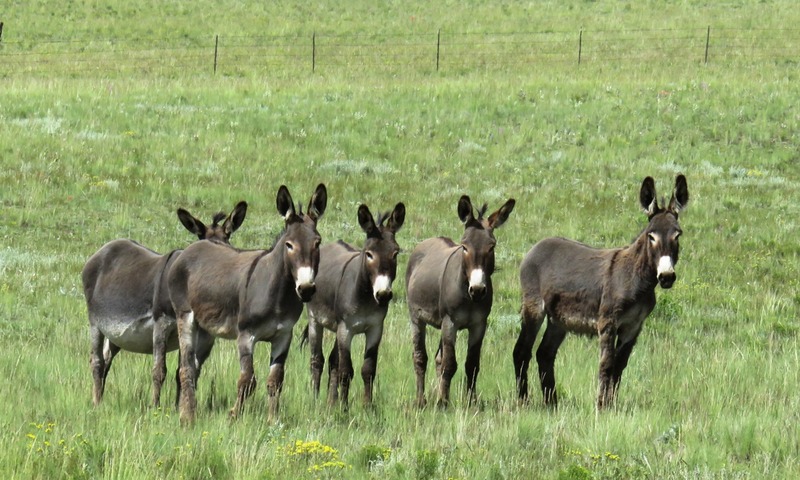 As we rode around the training loop, we had an audience of donkeys and cattle, seemingly giving us either curious or annoyed looks. Around 4 PM we rode back north, past the camp to a scenic overlook, where we paused for nearly 20 minutes. This panoramic photo shows the view from that overlook. While at this overlook, Trev and Russell posed for this next photo. Trev then took our group photo using my camera. We returned to camp by 4:30 PM and relaxed until dinner was served around 6 PM. The camp had a well-stocked, open bar and included a nice selection of Colorado-brewed beers. After dinner we gathered around the campfire and talked about our experiences during the day. By 9 PM, it was getting dark and we gradually retired to our lodgings. By 9:30 PM the generator was shut down, bringing welcome stillness to the camp. During the night, I had occasion to venture to the portable toilets and paused afterwards to admire the glorious, cloudless view of the very dark night sky and the Milky Way. Just before 5 AM, the generator started up! What an early wake-up that was! After putting in my foam earplugs, I soon fell back asleep. Breakfast was excellent and plentiful! I didn’t hear anyone complain about the food or preparation at the camp. Somewhere hidden out of sight was obviously a good kitchen, probably in the large truck parked adjacent to the building. For the newcomers taking just the Intro training course, Trev again demonstrated the proper techniques for safely lifting a fallen motorcycle, as shown in these two photos. Dusty stood behind him to demonstrate properly assisting another rider to raise his bike. At 9:40 AM we lined up at the staging point along the driveway, as shown in this next photo. Another beautiful day to ride motorcycles in central Colorado! Saturday’s training session was more intense than the preliminary session was on Friday. We initially headed south to the same training area as Friday and repeated the balance and other exercises for nearly three hours. At 12:30 we returned to camp for lunch. During the ride, I took this next photo as we were leaving the first training area. The wind was blowing our dust trails towards the south. The adjacent map shows our track for this day’s training sessions. 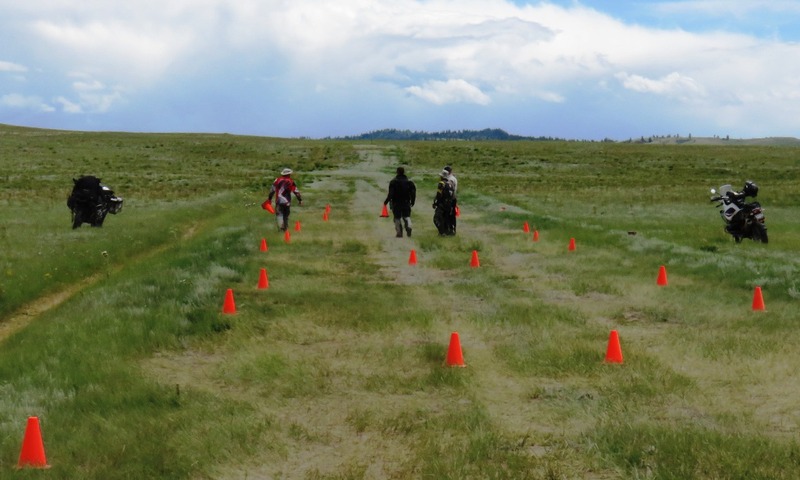 After lunch we rode north to the second training area consisting of a short section where the instructors set up traffic cones for us to practice tight circles and figure-eight loops. Upon arriving at there at 2 PM, we gathered around as Dusty, wearing the orange sweater, gave us instructions for this training session. In this next photo, Trev and Russell then demonstrated the maneuvers through the cones. 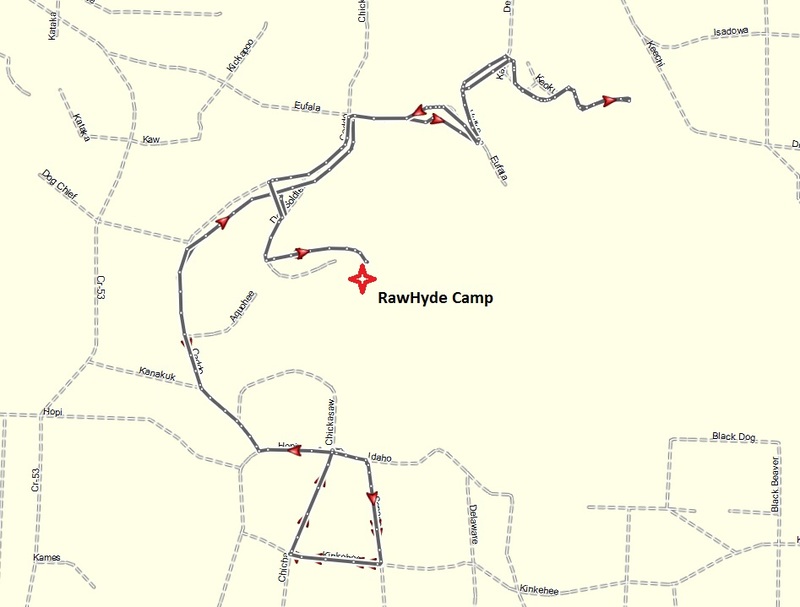 After each trainee successfully practiced the exercises several times over nearly 90 minutes, we departed this training area and took a long, scenic route back to RawHyde’s camp, arriving there just after 4 PM. Along the way, I took this next photo as we paused to let our group get back together. Once again we relaxed for a while around camp, enjoying beers and other adult beverages until another delicious dinner was served. The evening proceeded much the same as the day before, along with a beautiful night with a clear view of the stars. The final day’s training in RawHyde’s Intro program began just before 9 AM, starting with another visit to the first training area to the south of the camp for about an hour of warm-up and refresher exercises, including cone weaves. The following map shows our track log for today’s exercises, including our lengthy ride out to CO-9 after our training session ended. 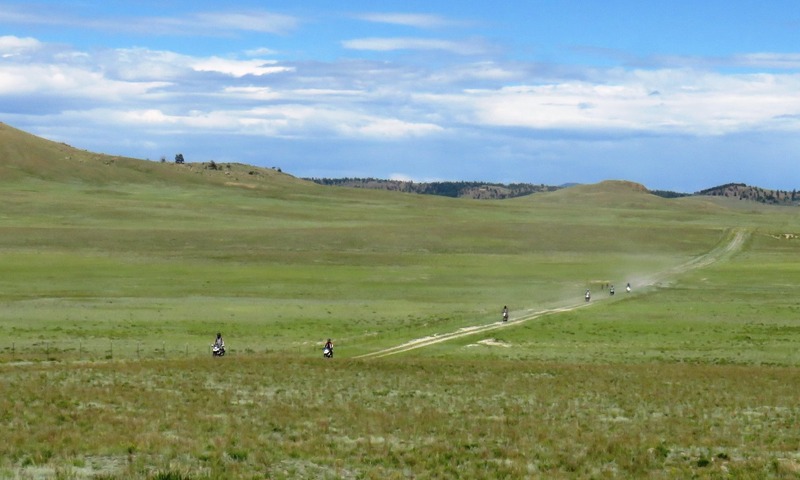 Following the warm-up session, we returned to camp since our next lesson involved riding a tight serpentine course, which is located directly east of the camp on RawHyde’s property and is fenced in to prevent livestock from “messing up” the course. Additionally, several small dirt piles were placed in a line to allow us to practice riding up hills and stopping briefly before continuing down the other side. In this next panoramic photo, a portion of the lengthy serpentine course can be seen behind the other riders. The exercises on this course were definitely more challenging due to the slope of the hill and the tight turns in each loop of the serpentine trail that required careful throttle and clutch control as well as weight shifting to perform the turns. Thankfully the trail was just dry dirt and not muddy! After practicing several variations of the exercises on that course and the small hills for nearly 90 minutes, we returned to camp for a welcome lunch break. Shortly after 1 PM we mounted up again for the afternoon session. This time we headed north to a section where several large hills allowed us to practice our hill climbing and descending techniques at speed on much more challenging terrain covered with more gravel. Being the first to traverse the hills, I decided to take photos of the other trainees as they came down the same steep hills, although they don’t appear to be that steep in my photos. After satisfactorily completing that exercise, we returned to the particularly steep and rocky hill to learn how to perform a proper turn-around after stalling or stopping when heading up a steep slope, although we were not asked to perform this exercise. In this next photo, Dusty has stopped halfway to the top of the upslope to explain the procedure. The next item on the day’s training plan was to ride through a modest section of sand followed by a small gully alongside the road. Instructors Trev and Russell demonstrated riding through it for us and we each took one or more turns to traverse the gully too. It doesn’t look like much in this photo of Trev doing the run, but it was a challenge for some of the trainees. Instructor Matt recorded videos along with humorous commentaries of each of our attempts and showed them to us later on the wide-screen TV at camp. After our 45-minute gully exercise, we returned to camp for a 20-minute break. 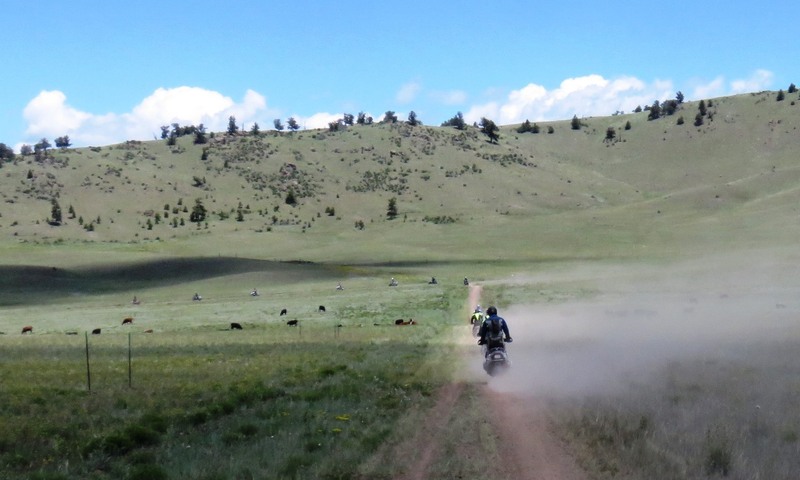 The instructors asked us whether we might be up for another lengthy ride, to which we all said, “Of course, we are!” We mounted up and headed south and east through a section of the Pike National Forest to reach CO-9. We continued north about 7.5 miles and turned off onto Buffalo Drive, which appeared to be part of another failed development project. Along this ride, I rode back in the pack and took several photos as we rode along. At one point we passed by another group of cows looking at us warily. We always slowed down when approaching livestock as we didn’t want to spook them and cause a collision. A few minutes later Trev and a trainee showed off by riding hands-free while standing for a short distance. As a final photo from this excursion, this next one shows the view north along CO-9. The structures visible near the highway are close to the entrance to Buffalo Drive. We couldn’t have asked for better weather all weekend! We arrived back at camp by 5:30 PM in time for another delicious dinner and conversation. After dinner, I hooked up my laptop computer to the wide-screen TV and showed photos from our three days of training. This article contains only a small selection of my nearly 200 photos. As mentioned, I had also signed up for the two-day “High Rockies Adventure” tour. In a separate article on this website, I have posted a lengthy article with numerous photos of these two days. The following is a short synopsis of that article. 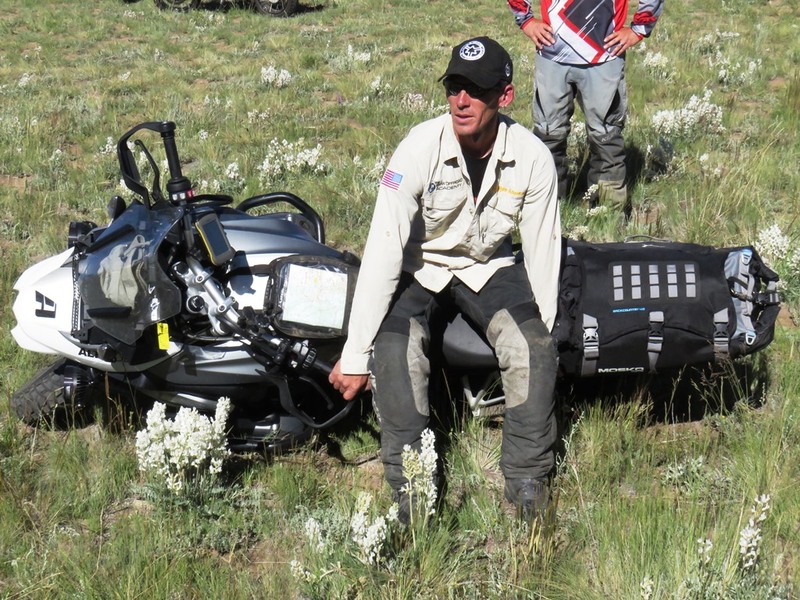 On the first day, Michael guided us over unpaved Boreas Pass, paved Hoosier Pass, and unpaved Weston Pass. These passes are located north of Hartsel. 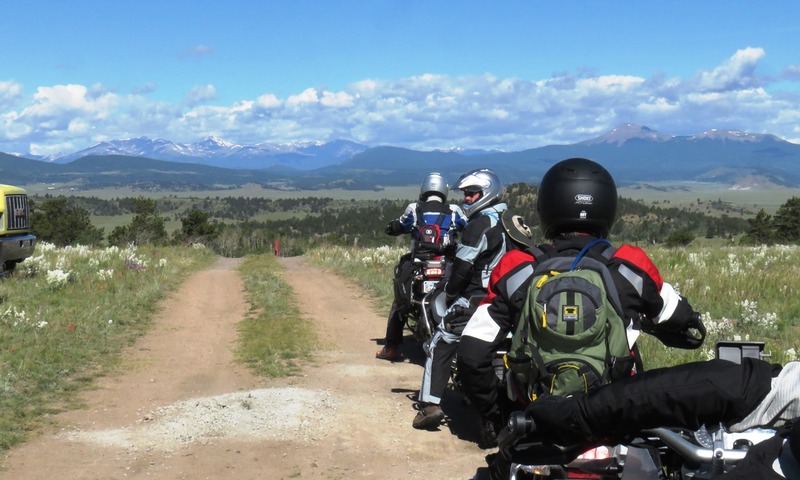 On the second day, the ride traversed unpaved Marshall Pass and Old Monarch Pass, located to the southwest of Hartsel. Some of these passes are former railway routes that no longer have any tracks. 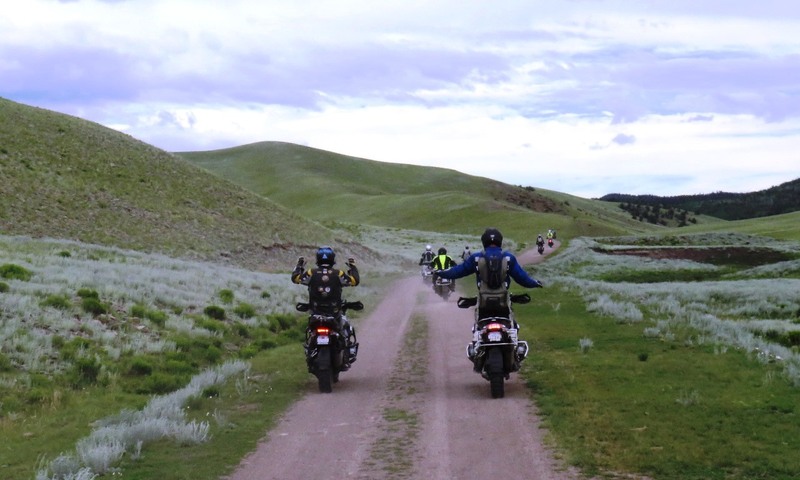 Although the weather was cloudy both days, we all enjoyed our rides over these passes in remarkably dry road conditions. However, on the second day, the clouds did more than just threaten rain back at RawHyde’s camp. A rain cell had been stationary over the area south of Hartsel and had rained intensively for quite a while, only letting up as we returned to camp. 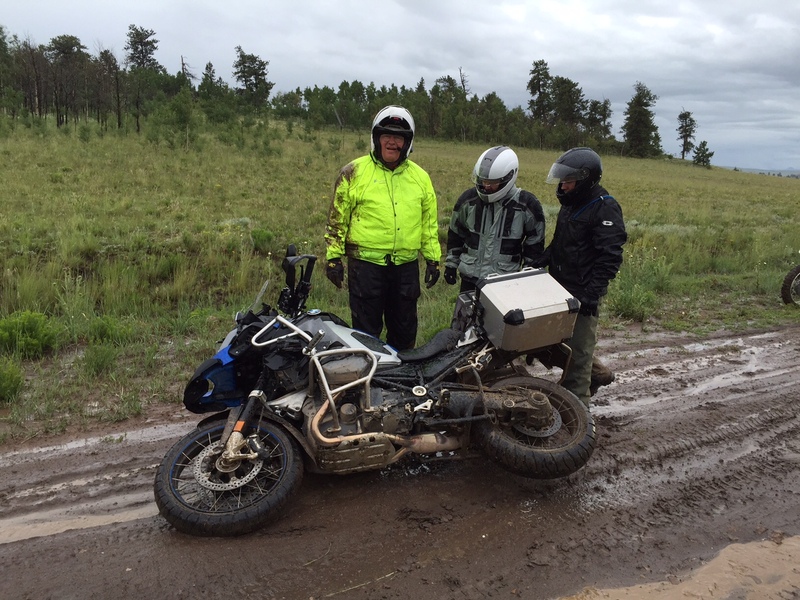 We found muddy road conditions along CR-53 and especially slick conditions on one side road leading to the camp’s location. 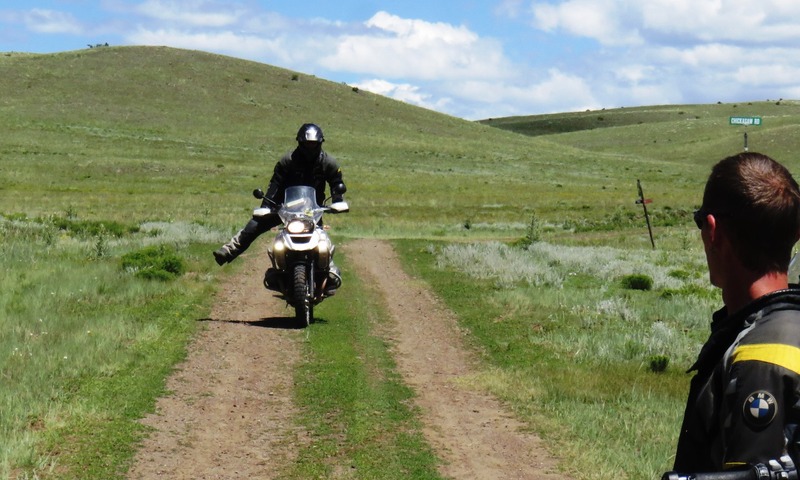 When the rider in front of me suddenly slowed down, I was unable to maintain momentum and became the only rider to fall over into the mud on that final stretch. Thankfully I had plenty of help from both trainers and other trainees in picking up my motorcycle again. It was undamaged and the mud was easily cleaned off when I reached a car wash facility in Buena Vista the next day. Thanks to fellow trainee Jason Alderson for capturing the moment. 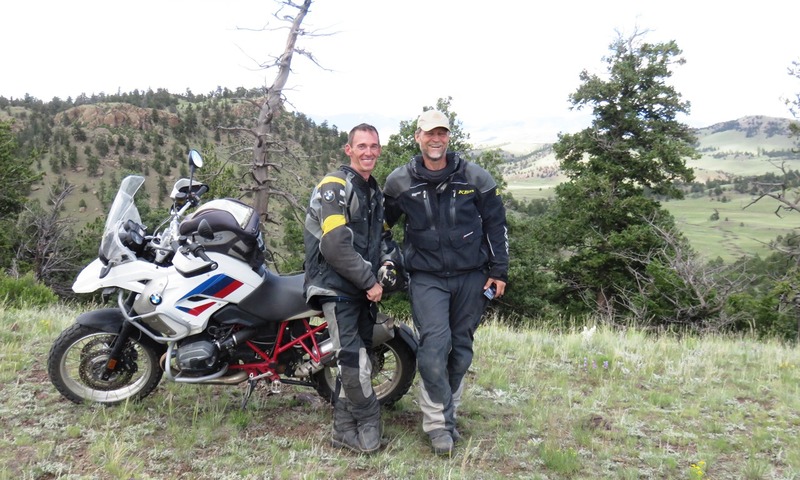 My personal experience at the RawHyde Adventure Camp was quite good and I am looking forward to attending their Level-2 class, called “The Next Step” in the future, either again in Colorado, or at their facility in California, or elsewhere. The courses are not inexpensive, but the intense training and counseling along with the supporting staff and facilities make the investment in both time and money worthwhile. Everyone who participated in the training likewise seemed quite satisfied with their experience. After spending over $20K for the new motorcycle, another 10% to learn to ride it confidently in off-road conditions was just part of the package for me. 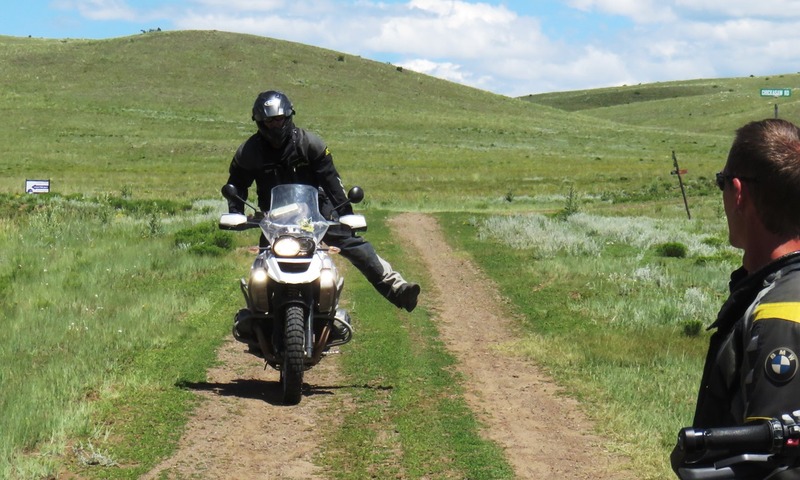 Several riders, who haven’t yet taken the RawHyde course in Colorado or California, have asked me why I didn’t take the similar course at the BMW Performance Center in Spartanburg, South Carolina, especially since it’s much closer to my home in Florida. My answer to them is that I like the coolness and the scenery of the high Rockies in the summer, particularly compared to the heat and humidity of the southeastern US then. 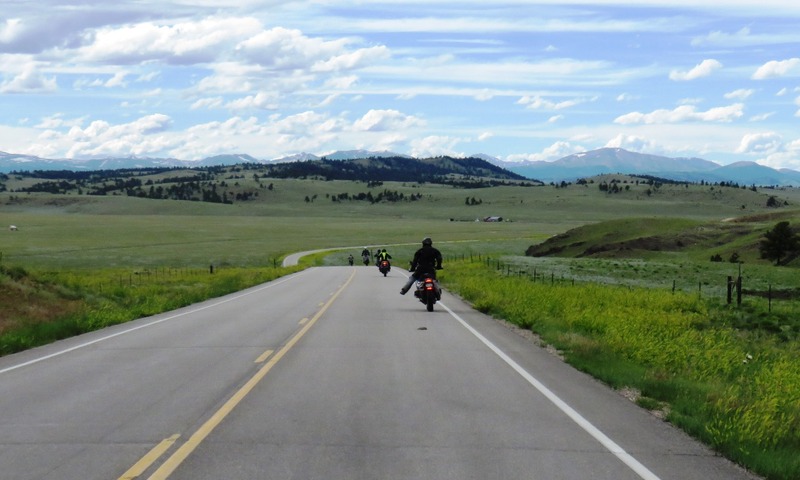 Additionally, the High Rockies Adventure ride over passes nearly 12,000 ft. in elevation cannot be easily duplicated elsewhere. Otherwise I would agree that taking the training in Spartanburg would be a good option. 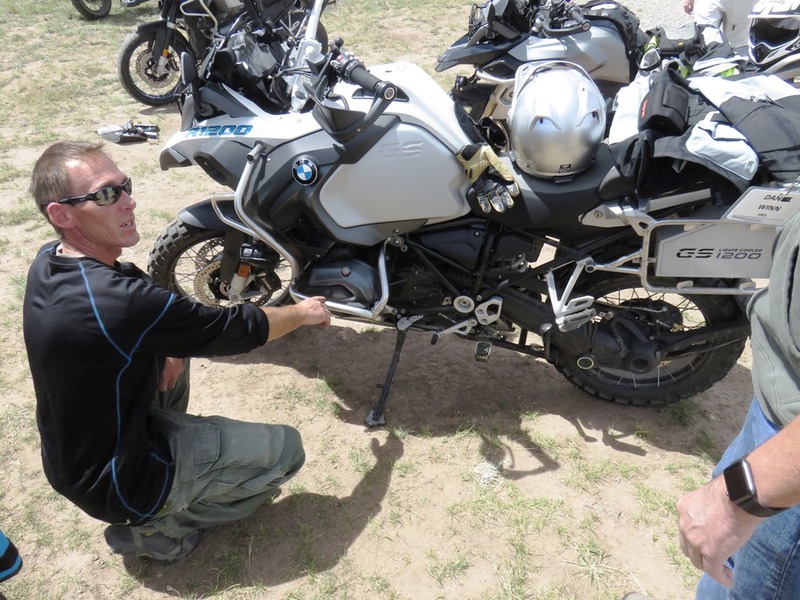 Jim Hyde, the founder of RawHyde Adventures, has collaborated with BMW on developing the off-road training courses and both include essentially the same curriculum.